Here are two stocks that could produce fantastic returns in your portfolio over the long run. There are certain things you should look for in stocks you buy for your retirement portfolio. For example, steady and consistent profitability must be a priority, as should the ability to make it through tough economic times relatively unscathed. With that in mind, here are two excellent stocks you can use to build retirement wealth. 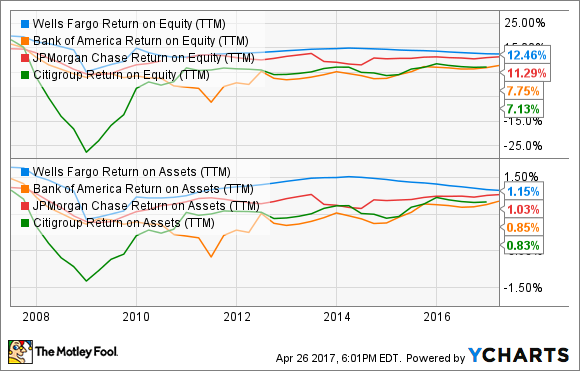 Net-lease retail real estate investment trust Realty Income Corporation (NYSE:O) is a stock that works great before and after retirement. With a fantastic track record that includes 16.9% annualized total returns since its 1994 IPO and average dividend growth of 4.7% per year, Realty Income can certainly help you build retirement wealth. 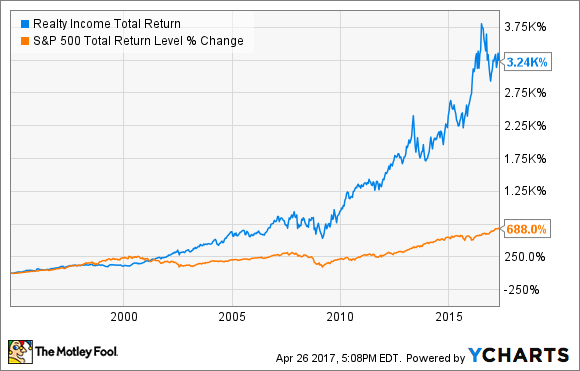 As you can see from the chart below, Realty Income has generated roughly five times the total return of the S&P 500. And with consistent monthly dividend payments (561 in a row), Realty Income can provide a steady income stream after you retire. Realty Income's primary property type is freestanding net-lease retail. Think of retail companies that tend to operate as the only tenants in their building -- Walgreens, Dollar General, and Wal-Mart are some good examples that are among Realty Income's top tenants. No tenant represents more than 7% of the company's rental revenue, and the properties are spread out across 49 states and Puerto Rico, reducing location-specific risks. While many retailers are struggling, Realty Income's tenants aren't. Many are immune to e-commerce competition, and others are recession-resistant or even tend to do better in tough times. These tenants are also on long-term "net" leases, which means that they are responsible for property taxes, building maintenance, and insurance expenses. In a nutshell, Realty Income just needs to put a tenant in place and enjoy years of consistent, predictably growing income, which is then passed along to shareholders. And with occupancy of 98.3%, which has never dropped below 96%, the company has been quite successful in doing just that. You may have heard the phrase "slow and steady wins the race," and Realty Income is a great example of this concept in practice. An investment in Realty Income is not going to make you rich in a month or two, but over several decades, this business model can produce massive returns. It may seem strange that I'm suggesting Wells Fargo (NYSE:WFC) as a stock you can use to build retirement wealth, especially considering that the bank is still dealing with the fallout from its infamous "fake accounts" scandal. However, that's exactly why I think now is a good time to get in. 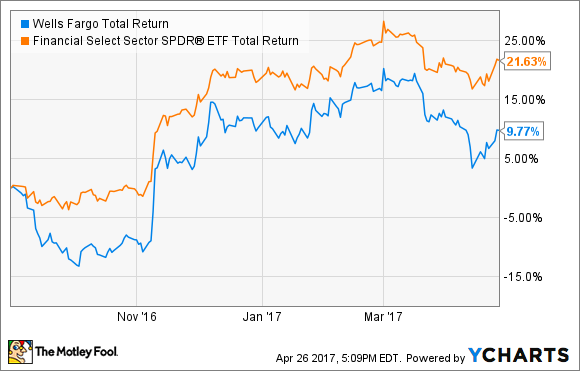 Since news of the scandal broke, Wells Fargo has underperformed the banking sector by a wide margin -- about half, actually. This is certainly understandable, as the bank's numbers have definitely suffered a bit because of the scandal. During the first quarter, Wells Fargo reported a year-over-year 23% drop in mortgage originations, and posted an uncharacteristically high 62.7% efficiency ratio, which CEO Tim Sloan called "not acceptable." While there is no telling how long the bank's numbers will suffer, I'm confident in saying that the post-scandal hit isn't likely to be permanent. For a long time now, Wells Fargo has consistently run a profitable and efficient banking operation, and has done it without taking unnecessary risks. This is why Wells Fargo emerged relatively unscathed from the financial crisis and why it's been able to grow so rapidly over the past few decades. And quite frankly, I don't see this well-defined long-term history of strong performance being permanently destroyed by the scandal. As you can see, Wells Fargo produces superior profitability to rivals, on a consistent basis. In addition, Wells Fargo pays a best-in-class 2.8% dividend yield, and I wouldn't be surprised if the payout rises considerably in the years to come. In short, this is a rock-solid bank (despite the scandal), and now could be a smart time to add it to your long-term portfolio.